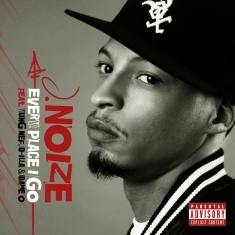 J. Noize (www.myspace.com/jheatfam ) understands instinctively that his native Chicago’s musical reputation is the envy of the world, yet the 24-year-old hip-hop producer-turned-rapper is undaunted in his quest to add his unique flavor to the 2nd city’s glorious history. With the release of his debut project, Young, Gifted & Black (Y.B.G), on the Soul Electric, J. Noize pours his heart and soul into a series of tracks that weave together to tell a story of the city and its denizens, yet each cut stands on its own as a singular masterpiece. As a rapper, J. Noize brings a reporter’s keen eye for observation of the underbelly of street life, in the process, exposing necessary knowledge for uplifting those stuck in an environment where there is seemingly no way out. J. Noize’s musical style, a gathering of hip-hop history from coast to coast and all points in between, suggests that he will indeed reach his lofty goal on Young, Gifted & Black (Y.B.G.). The collection, executive produced by John Hoerni and Roy Davis Jr., with production assistance from platinum producers Tim & Bob, Waajeed of the R&B group Platinum Pied Pipers, Doc Link, Joey Fernandez (who co-engineered the project with Kid Soul) and J. Noize’s own Heat Fam Productions, pulls the listener into his vision. After high school, J. Noize—a.k.a. Jason Davis—attended Chicago State University where none other than Kanye West’s late mother, Donda West, who was a teacher at the university, gave J. Noize her stamp of approval. “She said to me after I played her a four-song demo, ‘I’m gonna be honest with you, son, this is your calling in life.’” Armed with such a ringing endorsement, J. Noize threw all his efforts into improving his craft. “That was my motivation to continue as an MC and as a producer.” Friends later encouraged him to enter the “Dynamic Producers 2005” beat battle, where he ended up winning the city-wide competition in its only incarnation. By winning, J. Noize realized he truly had the goods to take his talents to a larger stage. When J. Noize related Mrs. West’s glowing critique, Roy Davis flew J. Noize to Los Angeles, where he was producing tracks for Dexter. “Roy has been like a brother/father to me. I was the last of four children, and Roy pretty much guided me through everything I was going through while growing up; he was my rock and kept me focused in the right direction.” While in Los Angeles, J. Noize absorbed all the nuances of a state-of-the-art studio, and took the experience back to Chicago, where his reputation grew as one of the top underground producers in the city. Over the years, J. Noize worked with Chicago acts King David & Goliath, Brittany Jenean and, currently, Erin Martin. So, with his reputation assured, J. Noize calls in favors from the above-mentioned and more of the cream of the Second City hip-hop scene to flesh out his ideas and turn a dream into reality. Other featured artists on Y.G. B. include vocalists Kaye Fox, Andrew Bees of Black Uhuru, Manny and I.M.A.G.E., and rappers D-Illa ( J. Noize’s older brother), Kazi the Blak and Sunn. The 1st single from Y.B.G is “Find Him,” a tale of finding one’s positive direction in life. R&B diva Terry Dexter joins J. Noize, and later adds her voice, along with Sunn on “Bangin’ Beats & Dope Rhymes,” a hypnotic track that amply supports J. Noize as he spits hot rhymes. “Warning Shots” is an ominous tale of the senseless and seeming endless gang violence that saturates everyday life in the inner city which features Andrew Bees of Black Uhuru. The message, over a ragamuffin reggae rhythm coupled with a crunching beat, paints a grim picture that warns of malfeasance from both those sworn to uphold the law and the street denizens looking to survive some way, somehow. Young, Gifted & Black also features an appearance by Kazi The Blak along with Virgil Strafford on Knocking on Heavens Door Pt.3.